Modern buildings often demand high performance façades, which can be installed quickly to accommodate a tight construction schedule without compromising on safety and efficiency. The HCW Curtain Wall Support System by HALFEN, A CRH Company, provides an ideal solution for installing façades. 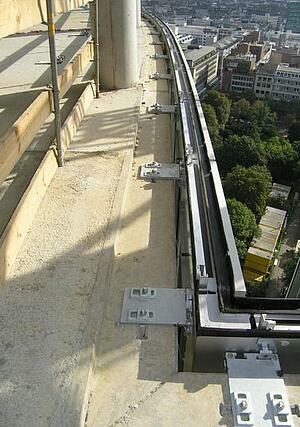 The HCW Curtain Wall Support Systems consist of a range of anchor channels and matching T-bolts provided by HALFEN. Additionally, special HALFEN brackets are used to connect the curtain wall façade elements to the main structure of the building. HALFEN HCW Systems are galvanized to ensure corrosion protection. HALFEN Anchor Channels are designed for longitudinal, dynamic, and high wind loads. HALFEN Brackets are designed for horizontal and vertical loads and easy adjustability. A torque wrench is the only required installation tool. Installing HALFEN Curtain Wall Support Systems eliminates any possibility of damage to the reinforcement. With HALFEN HCW Systems, you do not need to weld or use power-tools. HALFEN HCW Systems reduce on-site hazards, eliminate hand-tool vibrations, and minimize noise. HALFEN Curtain Wall Support Systems are engineered to perform. Visit the HALFEN website to learn more about load applications, specifications, installation, available products, and more.